Jason Homey has been playing 5-string banjo (both 3 finger style and clawhammer) since 1989. Three years running, Jason has been a first place winner at the Weiser Banjo Contest. He is also a two-time first place winner of the Western Canadian Banjo Championships and a long-time member of the folk-bluegrass-rock- band "The Clumsy Lovers". Since moving to Boise in the Fall of 2011, Jason has kept busy with an increasingly full schedule of banjo, mandolin, and guitar students. He has many years of experience teaching banjo workshops. Jason leads two well-attended weekly bluegrass jams in downtown Boise. ​Alan Munde began his long career in bluegrass music with the 1968 recording of Poor Richard's Almanacfeaturing Sam Bush and Wayne Stewart, followed by a traditional grounding in bluegrass music as a member of IBMA Hall of Fame member Jimmy Martin and the Sunny Mountain Boys. In 1972 Alan Joined his college picking friend Byron Berline in the forward-leaning bluegrass group Country Gazette. Alan continued as the anchor of the group for 21 years. Along the way, he recorded many highly regarded albums including Banjo Sandwich, and the Festival Favorites series. Alan participated in the 2001 IBMA Instrumental Album of the Year, Knee Deep in Bluegrass. His most recent recording is a duo CD with mandolin player Billy Bright titled Bright Munde. He taught in the Bluegrass Music Program at South Plains College in Levelland, Texas for 20 years. 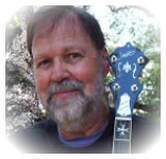 Alan has also published many instructional books for Mel Bay, instructional DVDs for Texas Music and Video, and participated in music workshops and camps both in America and Europe. ​For more info check the Al Munde's Banjo College. Gary Eller has played American roots music since childhood and has played banjo for over fifty years. He has played in countless bands in West Virginia, Ohio, New Mexico, Washington and Idaho. He has won or placed in banjo and band competitions in several states. Currently, Gary leads The Storytellers band and plays banjo for the popular regional progressive bluegrass band Chicken Dinner Road. He also was a board member of the National Old Time Fiddle Contest . Gary is also the director of the Idaho Songs Project and started the Weiser Banjo Contest. Originally from West Virginia, Gary had a thirty year career in nuclear science and engineering at Los Alamos National Laboratory. He resides at Pickles Butte near Nampa, Idaho. ​Here's an example of Gary's playing from his Slim's Banjo Journey CD. Greg Boyd has loved music and musical instruments since he was a very young child. Growing up in a musically active family nurtured his interest, as it was routine for family members to sing or play an instrument. In the 1970’s Greg began to study important differences between various instruments and their materials, playability, tone, value, etc. He began to travel a lot in mid-to-late ’70’s and 80’s, to festivals, to instrument builders, to small lutherie shops, to large regional stores, etc. In about 1980, Greg graduated from University of Montana with a degree in Wood Science. This formal training has been invaluable in understanding various woods and their tonal properties, when evaluating instruments or discussing their attributes. In the late 1980’s an opportunity to open a music store presented itself to Greg. In 1990 he was a partner in “The Stringed Instrument Division” until June 1997, when Greg left to open “The House of Fine Instruments”, in Missoula, Montana. This is the same “House of Fine Instruments” still in business today and has shipped instruments and accessories all over the world. 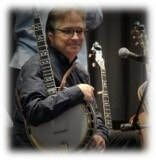 At Weiser Bluegrass Banjo Camp, Greg will teach sessions on banjo setup and maintenance. And he will bring a selection of fine banjos, guitars and mandolins and accessories for sale. Mark is a full-time instructor of banjo, guitar, upright bass, mandolin and fiddle - all the instruments needed for a bluegrass band. Mark frequents local and regional festivals and encourages his students to do the same. A mainstay of the National Old Time Fiddlers Contest at Weiser for many years, Mark was been a member of several regional bluegrass favorites including String Band Review, the Knott Brothers. Mark won the 1999 - 2000 Northwest regional Bluegrass Showdown, eventually finishing 3rd at the International Bluegrass Music Association. 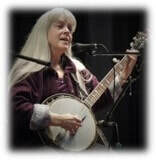 Janet Beazley plays banjo and sings with the California bluegrass band Chris Stuart & Backcountry, and with the folk duo Chris Stuart & Janet Beazley. Janet also plays and teaches classical music and holds a doctorate in Early Music from USC. She teaches bluegrass banjo to students of all levels. She also teaches traditional and baroque flutes, recorders and whistles, beginning mandolin, beginning dobro, as well as viola da gamba. Bill Evans is an internationally recognized five-string banjo life force. As a performer, teacher, writer and composer, he brings a deep knowledge, intense virtuosity and contagious passion to all things banjo, with thousands of music fans and banjo students from all over the world in a music career that now spans over thirty-five years. Click here to visit Bill's website and see what he is up to.